San Francisco, Calif., USA - December 10, 2012 - IBM (NYSE: IBM) announced today a major advance in the ability to use light instead of electrical signals to transmit information for future computing. The breakthrough technology - called "silicon nanophotonics" - allows the integration of different optical components side-by-side with electrical circuits on a single silicon chip using, for the first time, sub-100nm semiconductor technology. 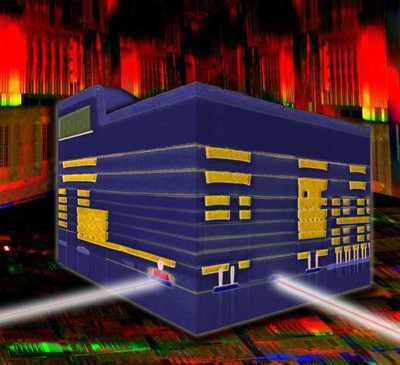 An IBM 90nm Silicon Integrated Nanophotonics technology is capable of integrating a photodetector (red feature on the left side of the cube) and modulator (blue feature on the right side) fabricated side-by-side with silicon transistors (red sparks on the far right). Silicon Nanophotonics circuits and silicon transistors are interconnected with nine levels of yellow metal wires. IBM (NYSE: IBM) announced today a major advance in the ability to use light instead of electrical signals to transmit information for future computing. The breakthrough technology – called “silicon nanophotonics” – allows the integration of different optical components side-by-side with electrical circuits on a single silicon chip using, for the first time, sub-100nm semiconductor technology. Cross-sectional view of an IBM Silicon Nanophotonics chip combining optical and electrical circuits. Silicon nanophotonics takes advantage of pulses of light for communication and provides a super highway for large volumes of data to move at rapid speeds between computer chips in servers, large datacenters, and supercomputers, thus alleviating the limitations of congested data traffic and high-cost traditional interconnects. 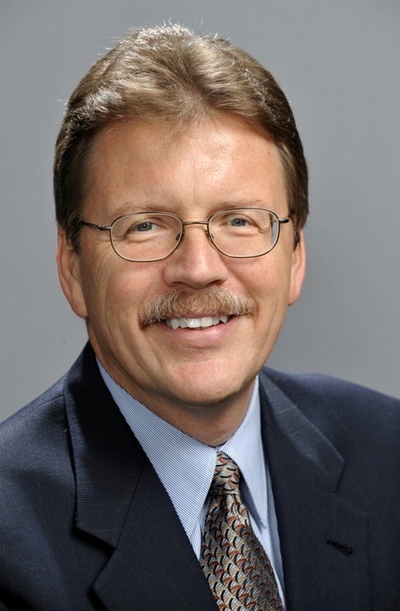 Dr. John E. Kelly, Senior Vice President and Director of IBM Research. “This technology breakthrough is a result of more than a decade of pioneering research at IBM,” said Dr. John E. Kelly, Senior Vice President and Director of IBM Research. 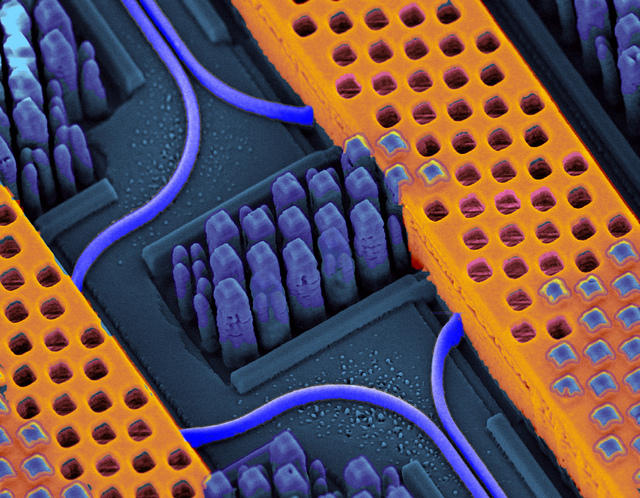 Information super highways inside an IBM Silicon Nanophotonics chip. Angled view of a portion of an IBM chip showing blue optical waveguides transmitting high-speed optical signals and yellow copper wires carrying high-speed electrical signals. IBM Silicon Nanophotonics technology is capable of integrating optical and electrical circuits side-by-side on the same chip. The amount of data being created and transmitted over enterprise networks continues to grow due to an explosion of new applications and services. 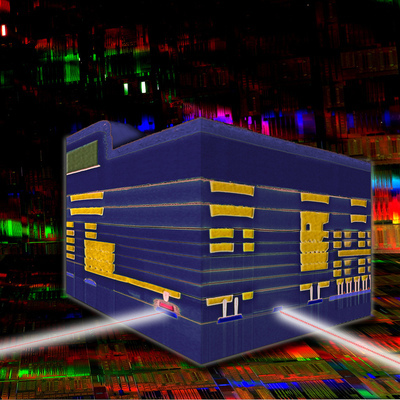 Silicon nanophotonics, now primed for commercial development, can enable the industry to keep pace with increasing demands in chip performance and computing power. Businesses are entering a new era of computing that requires systems to process and analyze, in real-time, huge volumes of information known as Big Data. 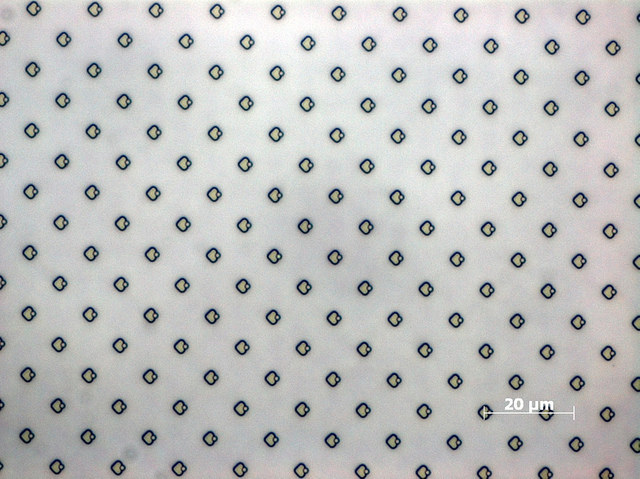 1-µm diameter fluorescent polystyrene spheres assembled in a corner array. The patterns can be used to prevent the counterfeiting of luxury goods. Silicon nanophotonics technology provides answers to Big Data challenges by seamlessly connecting various parts of large systems, whether few centimeters or few kilometers apart from each other, and move terabytes of data via pulses of light through optical fibers. Building on its initial proof of concept in 2010, IBM has solved the key challenges of transferring the silicon nanophotonics technology into the commercial foundry. By adding a few processing modules into a high-performance 90nm CMOS fabrication line, a variety of silicon nanophotonics components such as wavelength division multiplexers (WDM), modulators, and detectors are integrated side-by-side with a CMOS electrical circuitry. As a result, single-chip optical communications transceivers can be manufactured in a conventional semiconductor foundry, providing significant cost reduction over traditional approaches. 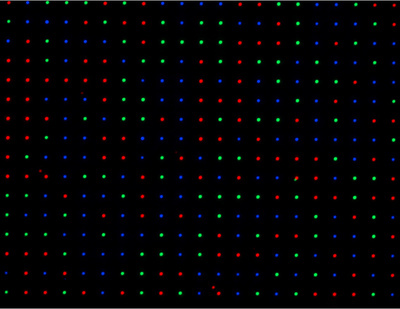 Fluorescence microscope image (channel overlay). The position of single particles is predictable, their color is not. IBM’s CMOS nanophotonics technology demonstrates transceivers to exceed the data rate of 25Gbps per channel. In addition, the technology is capable of feeding a number of parallel optical data streams into a single fiber by utilizing compact on-chip wavelength-division multiplexing devices. 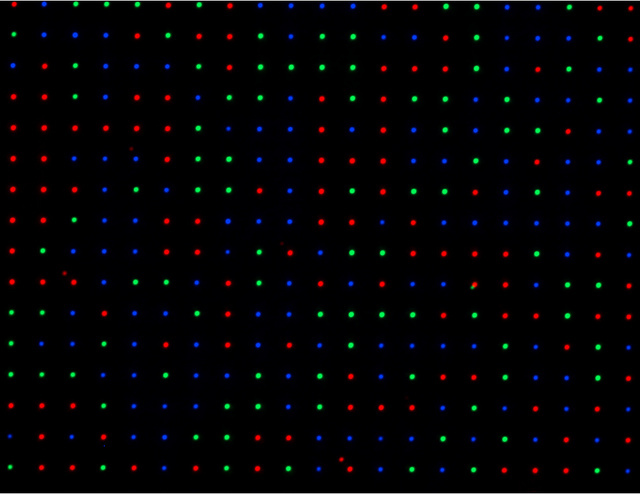 The ability to multiplex large data streams at high data rates will allow future scaling of optical communications capable of delivering terabytes of data between distant parts of computer systems.